Thanks to everyone who made it out for the 2013 Alumni Regatta! We had a record turnout this year with more than fifty team members, alumni, friends, and family in attendance. We have a monster newsletter for you this month. 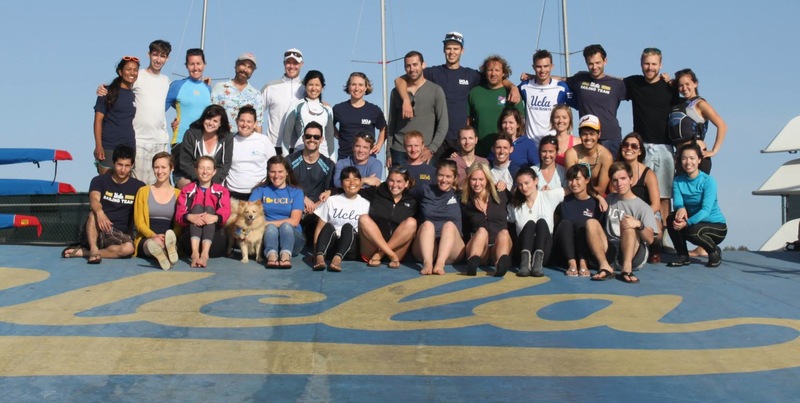 First, a recap of the Alumni Regatta by FOUST’s new secretary Oscar Jasklowski (’11). We had a record turnout this year with more than fifty people showing up to sail, catch up, and enjoy some good food and the perfect Marina del Rey weather. You can watch in-boat videos from a few of the team races on our website. The team revealed the until-now secret name of the new boat, and I am still blown away by their choice (thank you guys!). Huge thanks to the team, the Marina Aquatic Center, the Schweglers, and everyone else who made this event a huge success. Next up, profiles of the Class of 2013. These four sailors have made enormous contributions to the team over the last four years, and we wish them the best in life after UCLA. We also have a recap of the Edhec regatta in France from Billy Edwards (’12), and finally profiles of FOUST’s officer corps for the coming year, with Nora Brackbill (’13) and Oscar are joining the team. For our outgoing officers, Billy Edwards and Lyzz Schwegler (’07), I want to personally say thank you so much for everything you’ve done for FOUST – especially Lyzz, who has been part of this since the beginning, serving as President or Vice President for almost five years straight. Both Lyzz and Billy will of course continue to be involved with FOUST and the team – I’m not sure what we’d do without them. We’ve got a short newsletter for you this month as we gear up for the fall season. This edition includes the fall schedule and FOUST officer bios. If you’re in the Bay Area or willing to make the trip, go ahead and mark your calendars for the Stoney Burke regatta on October 15-16 at Treasure Island, where we’ll have an alumni tailgate. Starting next month we should have the first regatta reports in, as well as bios of the new officers on the team. It just so happens that this year’s winners were also the varsity sailors at PCCs and National Semifinals. Congrats guys!